Presenting The Vermont SF Writer’s Series Author Duel! For our next installment of the Vermont SF Writer’s Series, we’re switching things up a bit. Tor Books has four of their authors on tour in New England, and we wanted to have some fun with them. 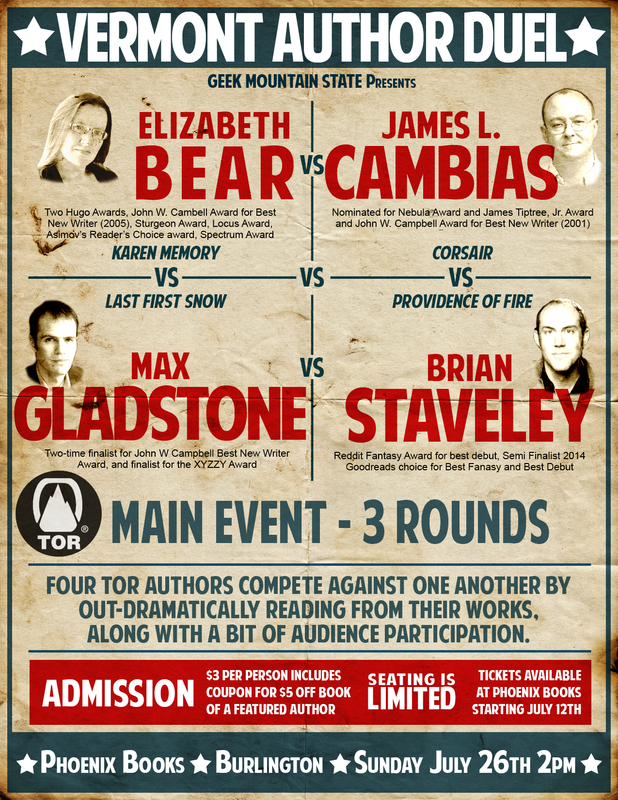 On Sunday, July 26th, join us and Phoenix Books to watch Max Gladstone (Last First Snow), Vermont’s own Brian Staveley (Providence of Fire), Elizabeth Bear (Karen Memory), and James Cambias (Corsair) compete against one another, to discover the most dramatic reader of the lot. BRIAN STAVELEY lives in rural Vermont. This is his second novel, following The Emperor’s Blades.